Getting started with Re:amaze for BigCommerce begins with installing the Re:amaze app from the BigCommerce Apps Marketplace. After installation, you will taken through our onboarding setup flow. Allowing customers to message you through your website is know as the Shoutbox. There is a unique script needed to integrate the Re:amaze Shoutbox (chat box) to enable live chat, real time customer events, optional proactive engagement via Cues, and optional embedded FAQ. When you're done configuring your Shoutbox Embed (either using the default configuration or advanced configuration), you'll be provided with a script. 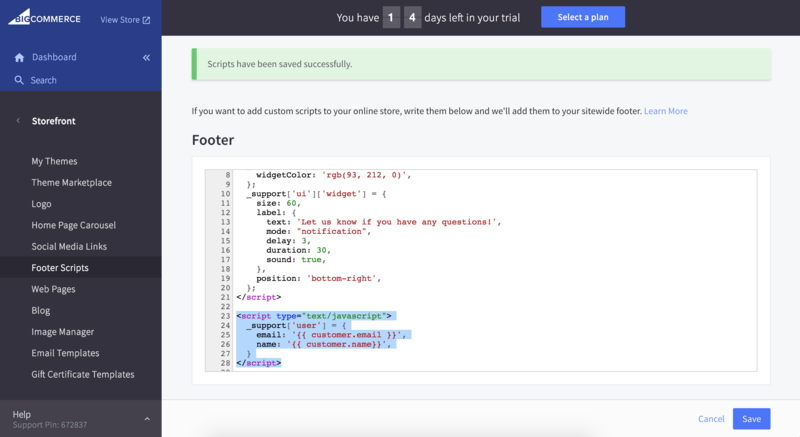 Follow the on-screen instructions and go to your BigCommerce Storefront settings and click on the "Footer Scripts" section and paste the provided script. 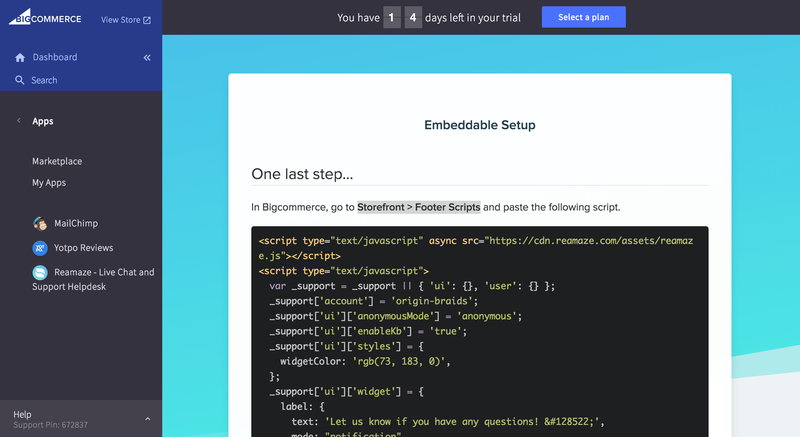 If you have other scripts in the Footer Scripts section, you can paste the Re:amaze script either at the top or at the bottom. Click save when you're done. NOTE: If you see an error for incorrectly configured script, please ignore and continue to save. If you preview your store after this is complete, you should see the Re:amaze Shoutbox live on your store front. NOTE: It may take a while for the Shoutbox to show up. If you do not see the Shoutbox after clicking on "View Store" at first, close the store preview and try again. 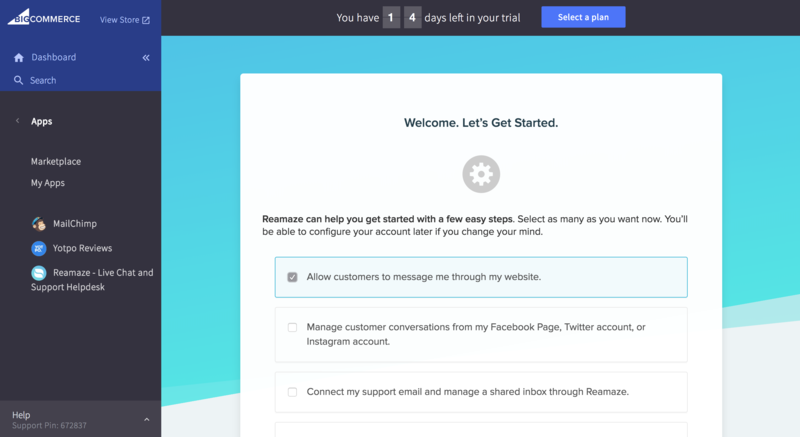 If your BigCommerce store allows customer login and accounts, Reamaze can be integrated into your customer-facing website to deliver seamless customer support by not always requesting for a known customer's name and email. We'll discuss this next. 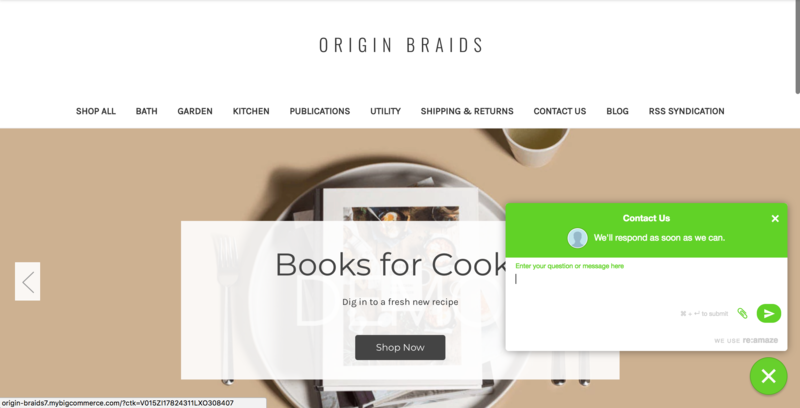 Simple SSO is designed for BigCommerce stores to give customers an easy way contact you without having to provide their name and email every time. Click save when complete. Customizing your Re:amaze Shoutbox is as simple as using the Embed Builder again found under "Settings" then "Embeddables". The Embed Builder will help you change the features of the Shoutbox without coding knowledge. A script will also be provided to you at the end of the process. Simple replace the original Shoutbox script you've pasted in Step 1.